This month we celebrate Thanksgiving Day. Most of us will gather with family & friends, eat a lot, probably watch some football…& then eat some more. At the end of the day many will think, “I shouldn’t have eaten so much!” But then we’ll do it all again next year. It’s an annual tradition that we thoroughly enjoy. Another thing many of us will do this week is be reminded of the tremendous blessings we’ve been given. This holiday helps us to annually focus on the good things God has done for us. 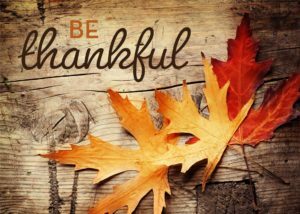 I’d like to offer a proposal that I think could bring an abundance of strength to our individual lives & to our country: Instead of giving thanks on an annual basis, let’s start each day with a thankful heart! Although many countries around the world build fences to keep their citizens in, the United States doesn’t have to be concerned about that. Why? Because we are a blessed nation. Multitudes from all around the planet have risked their lives, & in many cases lost their lives, trying to make it into the land of the free. We can daily thank our Creator for allowing us to live in the greatest country on earth. We certainly aren’t a perfect nation but we have opportunities that many in other nations can only dream of. I hope you’ll start each day with three simple words: “Thank You, Father!” Be thankful for your relationship with God, your country, your health, your family, your friends, your freedom, & the many other things you are blessed with. If your thoughts begin to focus on the negative issues or the problems you face, remind yourself that the vast majority of people alive today would give anything to have your life. Over the past several decades I’ve traveled all around the planet & there’s one thing I’ve become completely convinced of: There’s no place like home!